As part of Make Cycle Five for the CLMOOC, we were to tell a story with light. As part of this activity, I wanted to share some recent work I”ve been conducting with LEDs and making with others. Every spring we hold a free, open educational event known as the #print2pixel unconference. The event is a mashup between an EdCamp, an Ignite session, and some Unhangouts/Unconfernece thrown in for good measure. It’s a ton of fun. The best part is that we regularly have students from K-12 come in to present and learn with us. This year I wanted to push my own boundaries and present a maker faire style session using LEDs. I got this idea from reading a couple of blog posts that Michelle Schira Hagerman shared on her expertise making, and especially with circuits and LEDs. The best post that helped me out was this one she put together for the MAET Program. 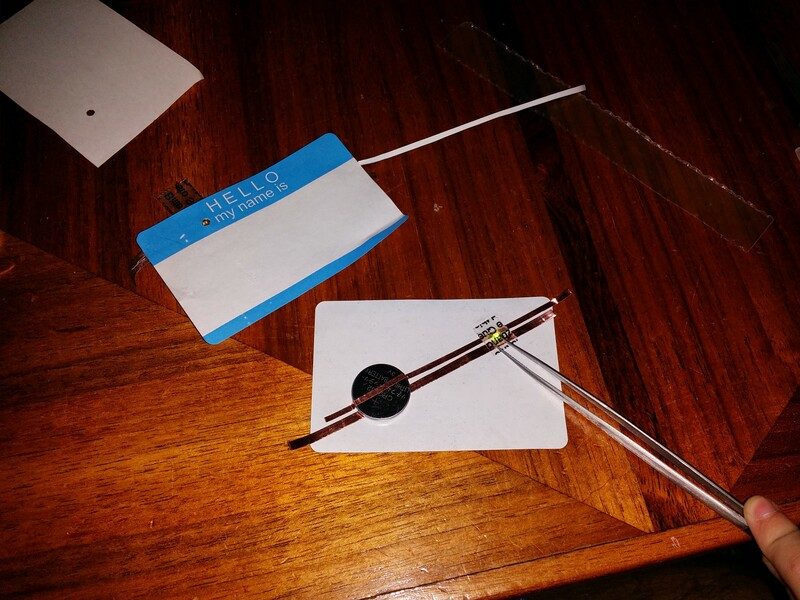 I was also motivated by this post on MiddleWeb from Kevin Hodgson to play with LEDs. For the #print2pixel session I decided to present maker activity #1 from this post. I purchased the following materials online. All told, it was just under $50 in supplies. The following amount will give you enough to create 100 LED kits. Basically, the process is very easy. I would recommend following the instructions on the MAET page, but I’ll share our process here as well. I planned on presenting the LED maker session with my son Jax who is 3 1/2, so we tested everything the night before. Decide where you would like the LED to shine through the paper/nametag/sticker. Use the hole punch to make an opening for this spot. From experience, it’s better to have this opening situated in a corner to allow you to attach the battery and copper tape as well. Cut a piece of copper tape that can reach across the back of the paper/nametag/sticker and “straddle” the hole you just punched. The length of the tape should be around 3 to 4 inches long. You’ll then cut the copper tape down the middle and attach one of the lengths to the back of the paper/nametag/sticker. NOTE: Be sure to have the copper tape straddle the hole. Still on the back of the paper/nametag/sticker you’ll lay the coin battery on top of the copper tape you just attached…positive side up. Attach the second piece of copper tape on top of the coin battery and make sure that it runs parallel to the piece of copper tape that is running underneath the coin battery. They should be parallel, and not touch…but be very, very close to one another. Michelle recommends a 1 MM space…I’d agree. Finally, you’ll dig one of the LEDs out from the teeny, tiny plastic housing it comes in. You’ll definitely want to order the tweezers for this operation. The LEDs I order above had a small green dash on one side (this went down) and a hole, or dot on the other side (this was up). We learned this through playing with it. The LED is a rectangular shape when you lay it down. You’ll want the LED to straddle the parallel pieces of copper tape you attached earlier. This part of the process is the most challenging…and the most rewarding. As long as you have the correct side down, you’ll want to rotate the LED to make either end straddle that tape. After some adjusting…you’ll see that light (and your learner 🙂 ) light up. You can then adjust your tape, and LED to achieve the brightness you’d like. Some of our more advanced students flipped the LED and adjusted the copper tape because they wanted the light to shine out of the front of the paper/nametag/sticker. Once you have everything the way you want it…use the double-sided tape, or copper tape to secure everything. You’re all set…revel in your skills as a maker. Wear that badge proudly and attach LEDs to everything!!! Adjusting the LED. Notice the arrangement of the copper strips. Little hands are good makers. 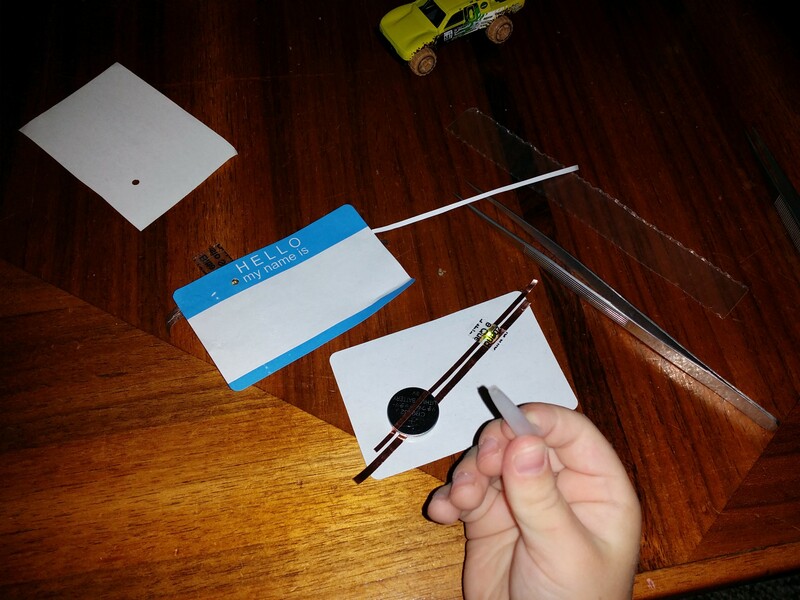 I mentioned earlier that I co-presented this maker session with my son Jax who was 3 1/2 at the time. He was the perfect helper and was (a little too helpful) in handing out supplies to participants. I mentioned this to his teachers in his pre-school class of “rising” three year-olds. They indicated that they’d love to have me come in one day and put together a maker session with Jax’s class. I put together an impromptu teaching session with his teachers the weekend before and left them all of my remaining supplies from the order above (more than enough). I indicated that they should play and figure out what options were available. 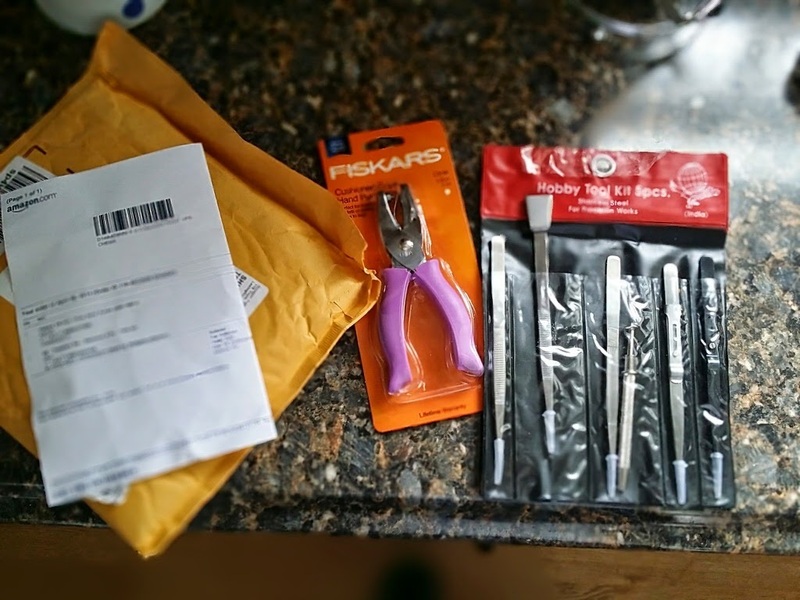 I also sent them Kevin’s post on LEDs, paper, and writing. The teachers modified the above process a bit. 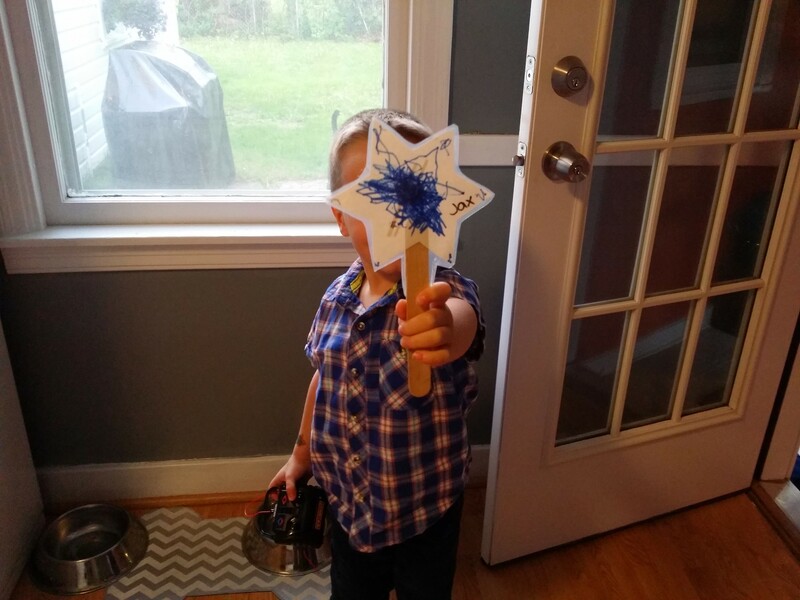 Instead of name tags, we settled on card stock cut into stars and attached popsicle sticks to hold them. After the students decorated the stars, we helped them assemble the LED circuit to the star. Finally, the teachers sealed everything up with clear contact paper to laminate the whole project. We wanted the circuit to be visible from the back so the children could explain to their parents what happened. The stars turned out great. In the future, we’re planning on decorating card stock to look like a mason jar full of “lightning bugs” and add 2 to 3 LEDs on a circuit to make some of them glow. 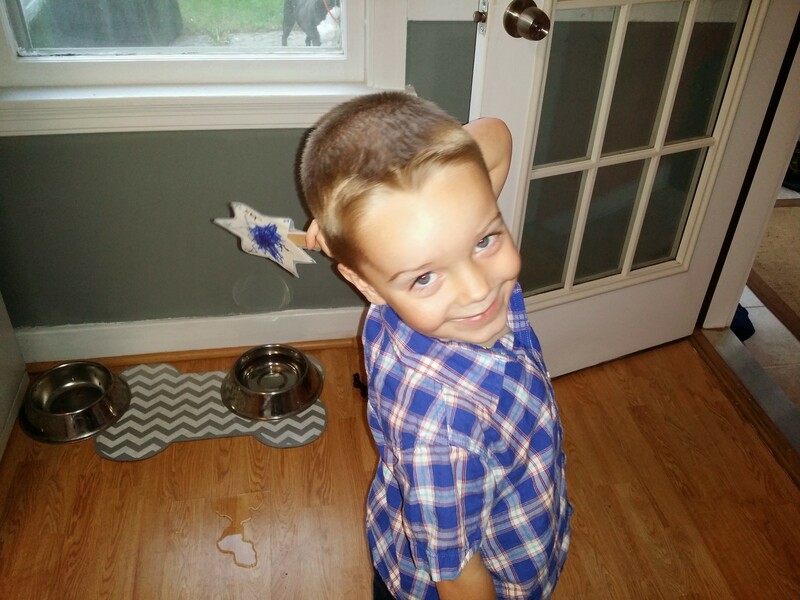 Jax sharing his “star make” with Mom when we got home. Forget being a “digital native”…I’m a maker. All in all the LED makes were a great experience. At #print2pixel there is nothing better than seeing people try, and try, and try…and then light up when they get that LED to finally light up. We had a mix of participants from middle school, to high school, and higher ed. All tried, played, and learned together. The maker session with the pre-school class was fun as well. We needed to have brownies on hand to lure the children away from the teachers as we adjusted the LEDs on the circuit. I definitely recommend this activity to all ages and groups.